Only a few weeks ago, Bobby Petrino was a rock star in Fayetteville. But now he has been fired as head coach of the University of Arkansas, reported less than an hour ago by Joe Schad. 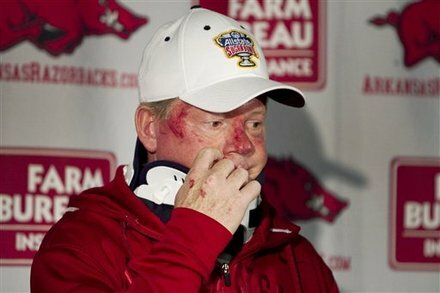 For those who do not know why this is (or why Petrino is in rough shape in the picture above) is because the Arkansas football coach was in a motorcycle accident off Highway 16 near a town known as Crosses, Arkansas. Initially he said he was riding solo but it was then reported that he was riding with a a 25-year old woman named Jessica Dorrell, whom he has hired as "student-athlete development coordinator." The 51 year-old Petrino, who is married, then admitted to having an inappropriate relationship with Dorrell, who is engaged to be married. Nobody can really say they are surprised by this, this seemed to be inevitable because what Petrino did was inexcusable. But now the question is who will follow Petrino as coach of the Razorbacks, after the large amoutn of success he had.